Can Flavored Ice Really be a Healthy After School Snack that Kids will Love? When I heard about LifeIce a new bite-sized all-natural frozen treat I thought that it might be something my kids would enjoy for an after-school snack. When the package arrived I was a little disappointed. 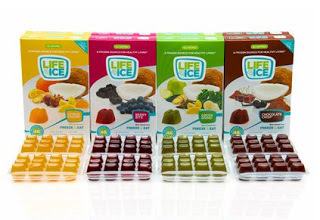 LifeIce comes in four flavors, Citrus Chomp, Berry Bite, Green Grind and Chocolate Crisp. I had the opportunity to try their Citrus Chomp flavor. After freezing it overnight the package was very difficult to open. It took my husband nearly five minutes just to get it open and remove one tiny bite sized cube out. They tasted like a cheap popsicle and after reading the ingredients, “Filtered Water, Agave Syrup, Coconut Water Concentrate, Orange Juice Concentrate, Apple Juice Concentrate, Mangosteen Puree,” (and a few more natural ingredients) I came to the conclusion that I could make something very similar, for less money, and maybe even healthier with my Ninja Blender and an ice cube tray. I am planning on trying my own recipe this weekend and I will share with you how it turns out next week. A half a carton (24 cubes) is considered a serving size, for six dollars a piece you are getting two three dollar popsicles. I have five kids so that would cost me about $20 for all of them to get one serving. Those are expensive popsicles! When my kids come home from school they are famished and require a nutritious snack that is more satisfying than an ice cube. I usually serve them fresh fruit, veggies and dip, crackers and cheese or home made granola. The founder of LifeIce, Paulette Fox had a wonderful idea and concept behind this product. I just don’t think that it is a good snack for kids. LifeIce is fat-free, low in calories and sugars, gluten-free, Kosher-certified, GMO-free and without preservatives. She originally created the product to help hydrate and comfort her mother who was battling ovarian cancer. LifeIce supports ovarian cancer awareness and has partnered with the Ovarian Cancer Research Fund. In my opinion, LifeIce would be perfect for hospitals and maternity wards but I would not recommend it for an after school snack for your kids. For more information about LifeIce visit LifeIce.com. *Disclosure: I received a package of LifeIce in exchange for this review. All opinions are accurate and 100% mine. I'm a mother of 2 kids ages 3 and 5. After reading your review and then checking out LifeIce's website, I'm thinking this has got to be a much better snack option for my kids instead of a run to the ice cream shop or popsicles that always make a mess. The website calls them mini-popsicles. And, it even comes in chocolate! I think it's a great idea. I'm curious enough to still try this out for my own kids. (Also, I think it's 48 of those cubes in a box, not 24). Thanks for visiting! The box says that a serving is 24 cubes, which is one tray. Yes you are correct, I made a mistake and one serving is a half of a carton or 24 cubes so there are two servings per box not one. I will correct that in my review. Feel free to try them out for yourself. You might like them. Personally I didn't care for it and thought they tasted like popsicles. Maybe the chocolate will taste better. I haven't tried that one yet. Thank you for visiting!